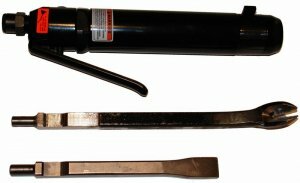 If you are tired of struggling to remove stubborn nails from 2x4's, the pneumatic NailOut might be just what you need. At 4,600 blows per minute it would be impossible for your hand tools to keep up, and is literally 10 times faster then the average human. Plus unlike carpenter Joe, the NailOut doesn't get tired after a half a dozen nails. Out of all the Cat Paws on the market, this one is the Cat's meow. Check out their website for a complete list of their products, and also take a look at their snazy looking shirts. What can I say, I am a sucker for nice looking t-shirts. You can pick up the pictured NailOut ProPack 2 from Amazon , and get free 2nd day shipping with Amazon Prime.